In a bid to get your year off to a healthy start, we’re inspiring you to get juicing with some healthy smoothie ideas for families. Keen for you and your family to get your five-a-day, and more? Here are some healthy fruit and vegetable smoothie ideas for everyone to enjoy, with ideas from everything from a fertility-boosting smoothie to weaning purees. A fertility-boosting smoothie: It’s important to help support your body when you’re TTC, and make sure you’re eating healthily. If you are trying for a 2019 baby, try this fertility-boosting smoothie from Madeline Shaw, which is packed full of tasty fruit. The non-alcoholic cocktail for pregnancy: Missing out on your nights out? Try this mojito-inspired spinach, avocado and lime smoothie for the cocktail taste with no alcohol and lots of vitamins. Breastfeeding boost: Eating healthily when you’re breastfeeding will support your milk supplies, and certain ingredients – such as oats – can boost milk supply. Here are seven ideas for lactation-boosting smoothies you can whip up in a blender. A wake-me up for sleep deprived parents: Up with the kids? Wake yourself up in the morning with this coffee chia smoothie. Weaning recipes: If you’re weaning your child with purees, you can easily use your blender to whip up super-smooth fruit and vegetable pastes. Here are some ideas for weaning recipes for the first year. The nursery germ banisher: If your small children bring home all the bugs for you to catch, make yourself this ‘flu fighter’ smoothie with ginger and citrus. Even if it doesn’t banish the sniffles, it’ll be good for you. Smoothies fit for fussy eaters: If your children are picky about what fruit and veg they will eat, try them with a smoothie – the novelty might convince them to try it. Here are four healthy smoothie recipes for kids. We’re giving away a NutriBullet 600 series blender and three months’ supply of either Pregnacare Max or Pregnacare Breast-feeding in our brand new competition. A blender with a difference, the NutriBullet breaks down whole fruits and vegetables, giving you the maximum nutritional benefit in a great-tasting smoothies. 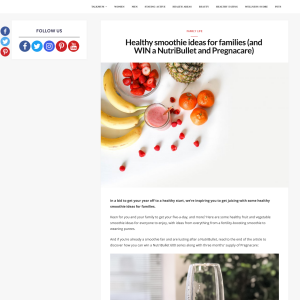 Use the Rafflecopter widget below to leave a comment to let us know which of the healthy smoothie ideas for families you will make for your family.